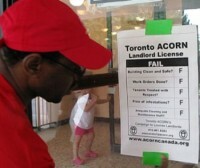 This entry was posted in Uncategorized and tagged ACORN Canada, landlord licensing, tenant organizing by wade. Bookmark the permalink. Toronto’s new mayor Rob Ford is a populist and it is important for him to know that all tenants want the city to keep all its tenant programs. It is very important that he get lots of calls from tenants demanding he retain all tenant and housing programs.